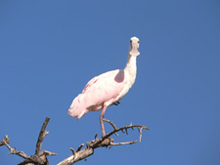 This is our premium tour and takes place in the Estero Soldado near Condominios Pilar. This large protected estuary is home to numerous varieties of migrating birds and lies in the morning shadow of the majestic Bacochibampo mountain. A guided tour take you through the mazes of the mangrove-lined estuary to enable “up close and personal” viewing of the intriguing birds in the mangrove areas, most of which are not accessible by foot. We’ve counted and photographed over 38 varieties of these shorebirds/wadingbirds, some of which are year-round residents. Our guides know the likely locations to find different species and will assist you through the estuary entrance, which is sometimes challenging due to tidal flows. The local dolphins cruise by daily, and whether you just want to get some exercise, or cruise all the way to the islands, we have a kayak and a tour for you. 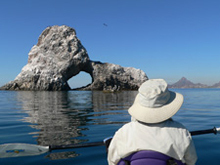 This tour is normally undertaken only on calm days when it is relatively easy to reach the first (Isla Blanca) of the two nearby islands, which is about one mile from shore. Isla Blanca is a nesting site for both the Brown Pelicans, and primarily, Yellow-footed gulls which can be seen on their nest or protecting their young in small caves on the west side of the island during late spring. The clear water surrounding the island often yields views of interesting schools of baitfish or their predators. Isla Blanca is normally reached in about 30 minutes, and the unique Isla Ventana (a.k.a. Window Rock) is reached in another 10-15 minutes. This island hosts resident populations of Blue-footed Booby birds, as well as other gulls, pelicans, and frigates who use the island as a home base when they are not fishing. As with the Estuary Tour, there is a high probability to come across our resident school of dolphins who will entertain you with their frolicking, often around or under your kayak. We have a limited number of kayaks and gear for light tackle kayak fishing, and this can be an exciting experience for light tackle enthusiasts. 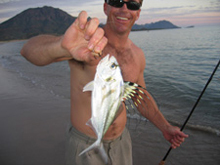 The rocky shoreline out from the Delfinario offers a wide variety of pargo (snappers), mackerel, yellowtail, and sometimes skipjack and even dorado in the summertime. Other options exist to explore the rocky shoreline out from Marina Real which offers similar fish both resident and pelagic. Contact us for details and we'll arrange a custom trip, including the possibility of our charter boats, to meet your requirements.